Holly McPeak was inducted into the Volleyball Hall of Fame today in Holyoke, Mass., the birthplace of volleyball. Here are some of her accomplishments. Holly McPeak was a three-time beach volleyball Olympian for the United States and competed in the first three Olympic Games events for the discipline – 1996, 2000 and 2004. In 2004 she earned an Olympic bronze medal in 2004 with partner Elaine Youngs. She holds 72 career beach titles, including 19 FIVB titles, two FIVB Grand Slam events titles and 53 domestic titles. In 2002, McPeak became the first woman worldwide to surpass $1 million career earnings. She was named the MVP in three different USA leagues, along with being an eight-time Best Defensive Player of the Year in those three leagues. Cuba defeated the United States 25-21, 22-25, 25-21, 25-22 for the gold medal at the NORCECA Men’s Continental Championship. The win nets Cuba the last remaining ticket to the FIVB World Grand Champions Cup in Japan. OLY-2008-VOLLEYBALL-FINAL-USA-BRA, originally uploaded by betofaistauer. The International Olympic Committee has decided to accept Volleyball and Beach Volleyball, under the authority and governance of the FIVB, as Olympic disciplines for another Olympic cycle. 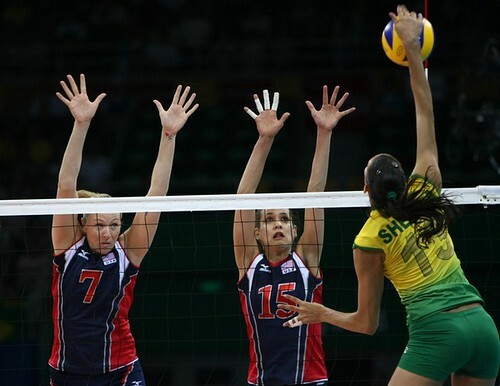 Volleyball and Beach Volleyball will be part of the 26 sports represented at the 2012 Games in London.